Capsule Summary: Hawkeye’s treasured longjohns are passed around the 4077th during particularly cold weather. “The Longjohn Flap” aired just two weeks after “Sometimes You Hear the Bullet” and was so very different in tone that I wonder if viewers in 1973 thought they were watching a different show. I doubt it, because at that point “Sometimes You Hear the Bullet” was really somewhat of an outlier. M*A*S*H was for more slapstick than serious during its first few years on the air. I love the opening scene. We immediately understand that it is freezing cold at the 4077th and we feel sorry for Radar having to do paperwork only to then see him stuff them into a stove. Our expectations are defied, hilariously. Hawkeye can be so cruel, flaunting his warm longjohns in front of Trapper and later basically taunting him for being cold and sick. And yet, after a few fake sneezes, Hawkeye gave his bunkmate the longjohns hoping they would keep him warm and help him recover his health. How believable is that? There’s no way to reconcile the version of Radar seen with the way the character was depicted in later seasons. First he uses the longjohns to score a date with Nurse Beddoes–and she makes it very clear how far she’ll go to get her hands on them. Then he decides to trade the longjohns for a leg of lamb the cook just so happens to have ready to go. In “Private Charles Lamb,” of course, Radar went to great lengths to save a lamb destined for dinner. It’s also difficult to believe Klinger would get away with sticking a rifle in Frank’s face and trying to rob him. Frank insulted him but apparently did not bring him up on charges. Exactly how Klinger could stand to be on guard duty wearing a dress is never explained, although perhaps his Lebanese blood kept him warm. Finally, if Henry was so sick that he was throwing up, had a fever, and his appendix was potentially moments away from bursting, how exactly was he able to hide his condition from the other doctors? Henry’s new dance: The Appendicitis Shuffle. The lack of winter clothing suggests this was the first winter in Korea for the 4077th. Otherwise wouldn’t at least some warm clothing be laying around? Hawkeye, Trapper, Frank, and Henry are all seen wearing the longjohns. Who looked better? Father Mulcahy also wore them but we never saw him in them. Only Margaret and Klinger never wore them. This was the first episode of M*A*S*H to be written by a member of the cast. It was also the first of 19 episodes written or co-written by Alan Alda. If it’s so cold why are Hawkeye and Trapper the only ones in the Mess Tent with blankets wrapped around them? And how does the cook stay so warm? The way Henry says “abdomen” is interesting. He pronounces it “ab-doe-men” rather than “ab-da-min” the way Trapper does. 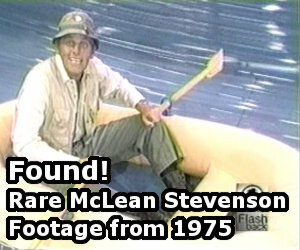 Something in the script or just the way McLean Stevenson talks? There are those who believe Margaret was waiting for the longjohns to dry after washing them when Klinger stole them. That would explain why she didn’t put them on immediately. I’m not so sure. I think she was trying to get warm enough by the stove to undress so she could slip into the longjohns. An enjoyable episode with plenty of laughs. Interesting question you post about Henry’s pronounciation of “ab-doe-men”. Perhaps it was in the scripts, but I have noticed that varying pronounciations of abdoemen seem to exist in different parts of the U.S. (in other words I have been around Americans who pronounce it both ways, although “ab-da-min” seems much more popular). One of my favorite episodes! I always saw Hawkeye giving Trapper the longjohns not necessarily because Trapper was “sick” (I think Hawk could tell he was faking), but more because he realized Trap wasn’t going to give up till he got those longjohns, so Hawk simply gave them to shut him up. At the risk of potentially sounding racist, I doubt Klinger’s Lebanese blood would keep him warm, and in fact, I figure he would be freezing moreso than others in camp because his desert heritage would probably help him tolerate heat moreso than cold; it’s like how African-Americans, or people of African descent have more salt in their blood than, say, people of European descent, and therefore, can do well in heat, but not the cold. I remember watching an Alan Alda special on BIOGRAPHY, and Gene Reynold mentioned this episode, saying that Alan had the idea for a story then pitched it to him and Larry Gelbart, then soon had a script drafted for it and pitched that, and apparently Alan was so excited about it because moreso than acting or directing, the one thing that Alan really wanted to do was be a writer, and he was excited about writing his first M*A*S*H episode. However, there’s one burning question about this episode that I’m surprised doesn’t come up more often: how is it possible that those longjohns just happened to fit everybody? Hawkeye and Trapper are about the same height and build, but Henry’s taller and a little paunchier; Frank and Mulcahy are a tad shorter but seem to be about the same build as Hawkeye and Trapper; and of course, Radar’s shorter than all of them. And did anyone happen to notice the doodie stains on the longjohns by the time Henry got his hands on them? I agree, BDOR. I think Hawkeye simply gave up when he gave them to Trapper….one of those “Oh, alright! Here – take ’em! !” kind of things….And I too had that question….In fact, I think my kids had the same question, too – how did the longjohns fit everybody? Of course, this is probably just another one of those things where we the viewers need to overlook – like Radar’s teddy bear during the time capsule episode, of which wasn’t the original teddy bear. As for the pronunciation of Appalachian – I’ve also heard it pronounced “app-a-lay-sheeun”, especially us in these parts of those mountains. 🙂 But, I never noticed how Henry pronounced abdomen….Interesting. Now I’m curious about your whereabouts, TWoods; I’m in the Great Valley (Cumberland Plateau to our west, Smoky Mountains to our east), but interestingly enough, we actually pronounce it “app-a-lah-chins.” Well, I do hear it both ways, but “app-a-lay-sheeun” is nowhere near as common; it’s interesting that being in such close proximity that there wouldn’t be a more common pronunciation. Regarding Radar and the lamb, in “Private Charles Lamb” he saw the lamb alive and in this episode it was already cooked. Probably had different emotions to a live lamb vs a cooked one. But Radar was raised on a farm, where killing animals for food is routine. But that episode has another conundrum. We know Radar is adept at circumventing army bureaucracy and red tape, but it is stretching credulity to think he crates up a live lamb, gets it from the MASH unit to an airbase, loaded onto a transport aircraft (which probably makes stops in Japan and Hawaii before reaching the US); now the crated lamb, hopefully still alive, is on an airbase in California during war time …what is on the cargo manifest concerning it? …is the Air Force going to deliver it 1500 miles to his family in Iowa? ..if not, can they afford the 1500 mile trip to California, then get on a military base during war time and claim a live lamb sent from Korea? There are enough holes in this plot to fly that transport plane through. Did anyone notice Margaret sounded a little odd in this episode? I’m referring to the scene when Frank is in her tent feeding her Camembert cheese and she asks how much she means to him. Frank shows her the long johns and she yells at him and takes the longjohns. Was Loretta Swit acting or was she truly sick? I’d appreciate a definitive answer. I absolutely hate this episode. In a series where we see people order gorilla suits, tuxedos, bathtubs, sides of ribs (with sauce), shotguns, sewing machines, dressmaker’s dummies, bowling jackets, etc.etc.etc. …no one can order their own long johns?? And given the constant complaints about the food, just who was that roast lamb cooked for? Didn’t they complain when it disappeared? Where did it come from? Based on most of your previous comments, I’m getting the feeling you don’t particularly like M*A*S*H.
Lol, actually MASH is one of my favorite series; and one of the few for which I have all seasons on disk. Otherwise I’d not know enough of it to critique. But I can think of only one TV show for which I liked every episode, and that is probably because only six episodes were created (Police Squad). Why was hawkeye mad when operating on Henry, did you see trappers face towards hawk during the operation. In the opening scene, do you notice that Henry accidentally call Radar “Corp” instead of “Corporal”? Or how Frank hits a pot of soup with a nasty spatula? That was worse than “the filth” being on the floor.